From Route 287 take exit 57. 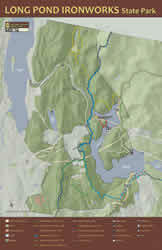 Follow Skyline Drive to Route 511 (Greenwood Lake Turnpike). Turn right and travel approx. five miles. From Route 23 take Union Valley Road (Route 513) approx. six miles and bear right onto Marshall Hill Road, which becomes Greenwood Lake Turnpike (Route 511). Parking is available at the north boat ramp, Beech Road and historic district parking lots. The old stone walls, furnaces and other remnants of the once industrious ironworking community now sit tranquilly next to the swiftly flowing Wanaque River. The village is undergoing research and restoration and one waterwheel has been reconstructed. Future plans call for additional restoration work. Approximately a 3/4 mile portion of the Hasenclever Iron Trail is temporarily closed to the public in the area of Peter's Mine. From the Ringwood Manor side it is approximately 1.5 miles in and 4 miles in from Long Pond Ironworks. There is currently no reroute, please plan accordingly. For more information all the park office. Long Pond Ironworks was founded in 1766 by German ironmaster Peter Hasenclever. Hasenclever brought 500 ironworkers and their families from Germany to build an ironworks "plantation," including a furnace, forge, houses, shops and farms. A dam at "Long Pond" (Greenwood Lake) on the upper Wanaque River provided the hydropower to operate a blast for the furnace and a large forge. Two more furnaces were constructed in the 1860s. Operations at the site ceased in 1882 due to the industry-wide conversion to anthracite furnaces using Pennsylvania coal. The remnants of the ironmaking industrial structures at this site date from the 18th and 19th centuries. Furnaces, casting house ruins, charging areas, ice houses, waterwheels and other structures are a part of the remains. The area is currently undergoing restoration: one waterwheel has been reconstructed and several houses stabilized. The "Old Country Store" has been renovated and now houses the Long Pond Ironworks Museum. The original Village of Hewitt grew up around the 19th-century iron enterprise. This settlement included a church, a store/post office, schoolhouses, and dwellings and outbuildings for workers and managers. Many of these cultural resources remain intact or as ruins. Members of the Friends of Long Pond Ironworks offer tours of the furnace area and village on the second Saturday of the month, noon and 2 pm, April through November. The museum is open to the public Saturdays and Sundays between 1 and 4 pm, with an earlier opening on tour dates during the April through November tour season. It is open by arrangement throughout the year. For more information, call (973) 657-1688. Known for its trophy size muskellunge, walleye, bass and trout, Monksville Reservoir is heavily used by anglers, sporting clubs and the US Sailing Association. Easily accessible from either the north or the south boat ramp, the area is open 24 hours a day, seven days a week. 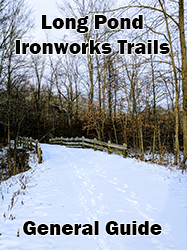 The property that comprised the Wanaque Wildlife Management Area, formerly managed by the Division of Fish & Wildlife is now under the administration of Long Pond Ironworks and Ringwood State Park. Within the property is access to Green Turtle Pond, which is stocked with trout in the spring. A parking lot and boat ramp are located nearby. The area also is open to hunting, with the exception of Sunday.